Unless you have been violently evicted from your country’s presidential palace, you are already having a better new year than Cuban president Fulgencio Batista was having at this point in 1959. 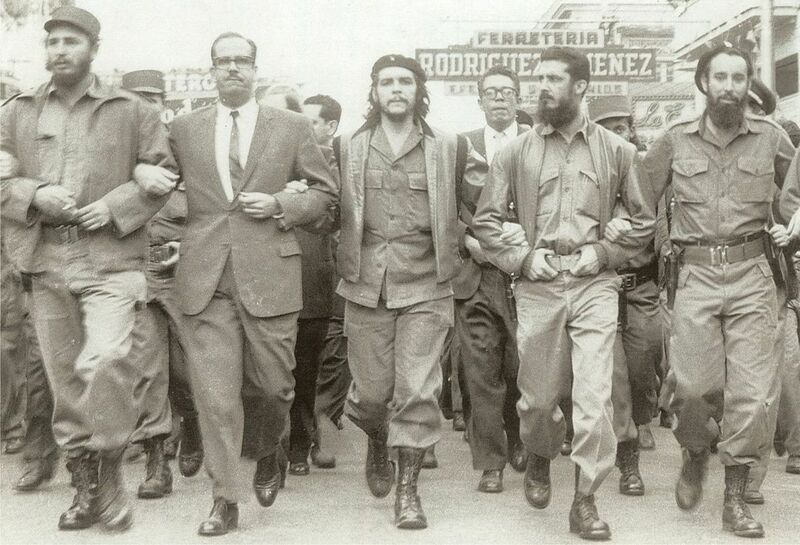 Cuban revolutionaries, including Fidel Castro (far left) and Che Guevara (center), in Havana in 1960. Photo via Wikimedia Commons. Unless you have been violently evicted from your country’s presidential palace, you are already having a better new year than Cuban president Fulgencio Batista was having at this point in 1959. Revolutionaries, led by Fidel Castro, had been fighting against the corrupt, virulently anti-Communist Batista regime since 1953. At the time of the 1959 revolution, it was not yet clear that the new regime would declare itself Communist. In “Revolution Without Generals” (January 17, 1959), The Nation’s Carleton Beals reflected on the prospects and perils of the revolution. The hero comes into power at the head of seasoned young veteran guerrilleros whose ranks were augmented only at the last moment by adhesions of rank-and-file soldiers and minor officers. He comes in at the head of a youth movement inspired with the ideal of a new free Cuba—youths recklessly willing to face torture and death, who have fought in the streets of every city and hamlet in Cuba for six long years. He comes in at the head of a student movement which has seen Cuba’s schools closed for years, which lost leader after leader to Batista’s police. He comes in at a time when every professional and civic group in Cuba—from sports clubs to the Rotary clubs—had broken with Batista. He comes in with the good will of a large sector of the Church hierarchy and certainly with the active backing of the Catholic Youth movement, the two leaders of which were recently taken out of their homes, brutally tortured and killed. He takes over a war-scarred country that yearns for peace, in which tens of thousands of homes have lost loved ones or seen them driven into exile…. Much of the course of events in the near future will depend upon the official American attitude toward Castro. Will our government be as lavishly helpful with him as it was with Batista? That has never happened before in similar circumstances. Maybe this time it will be different. And will Castro himself measure up to the great tasks that await him? Unlike previous upheavals in Cuba, largely determined by military elements, the prolonged struggle to get rid of Batista has awakened the people and released deep and violent social forces. A revolution has been set in motion and there is little likelihood that it can be stopped short of its objectives either by outside interference or by incompetent or recalcitrant leadership. Thus far Castro has shown the finest qualities of true leadership: self-sacrifice, dedication, patience, confidence and ready pliability in meeting the most difficult situations. He may indeed come to rank with that other great Cuban, José Martí, who carved out the shape of Cuban independence.